S. Raje,* K. Mani and R. Angamuthu. 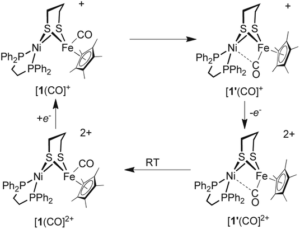 * Solvent-Free Solid-Phase Synthesis and Reactivity Studies of New Nickel(II) Borohydrides. S. Raje* and R. Angamuthu. * Hydride Synthesis Goes Green: Solvent-Free Synthesis and Utilities of Nickel(II) Borohydride and Nickel(II) Hydride. S. Raje and R. Angamuthu, C.-H. Tung, W. Wang. 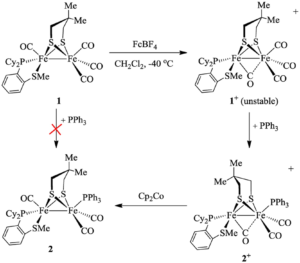 Synthetic [FeFe]-H2ase models bearing phosphino thioether chelating ligands. Chinese Chemical Letters, 29 (2018) 1651-1655. A. Zhang, S. Raje, J. Liu, X. Li, R. Angamuthu, C.-H. Tung, W. Wang. Nickel-Mediated Stepwise Transformation of CO to Acetaldehyde and Ethanol. Organometallics 2017, 3135−3141. X. Chu, X. Yu, S. Raje, R. Angamuthu, J. Ma, C.-H. Tung, W. Wang. Synthetic [NiFe] models with a fluxional CO ligand. Dalton Trans. 2017, 46, 13681-13685. X. Chu, X. Xu, H. Su, S. Raje, R. Angamuthu, C.-H. Tung, W. Wang. 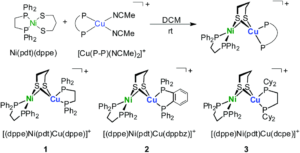 Heteronuclear assembly of Ni-Cu dithiolato complexes: synthesis, structures, and reactivity studies. Inorg. Chem. Front. 2017, 4, 706-711.